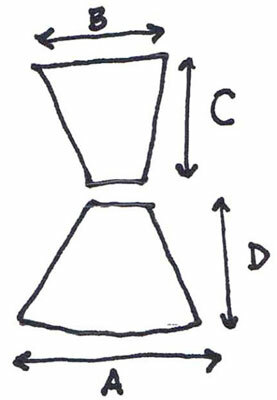 The basic torso is simply two trapezoids drawn one above the other. The upper trapezoid is upside-down, and the lower one is right side up. Both male and female torsos have these shapes, but each has a slightly different twist to represent the different dimensions of each gender. Men are much boxier than women. If you were to measure a man’s chest, waist, and hips, the three measurements would vary by 6 to 8 inches. A woman’s measurements at her bust, hips, and waist would vary by about 10 inches (34, 24, 34 are the average measurements for a model, according to the British Association of Model Agents). The more drastic variation in a woman’s bust, hips, and waist give a woman her curves. Keep the shoulders (Line B) on the upper trapezoid narrower than the hips (Line A) on the lower trapezoid. Keep the waist narrower than the shoulders and hips, and keep the trapezoids the same height. Line C is the same length as Line D. The waist falls where the two trapezoids come together. Although women normally have a narrower waist and larger hips than men, hips are relatively narrow in fashion illustration, and proportions may be more boy-like. Keep the upper trapezoid slightly taller than the lower trapezoid. Note that Line A is longer than Line B. Keep the waist fairly wide and the shoulders wider than the hips. Take a look at Line C (the shoulders), which is wider than Line D (the hips). The waist falls where the two trapezoids meet. A child’s torso is different from an adult’s torso. Kids haven’t developed the angles and curves that grown men and women have. Draw the child’s torso similar to a man’s torso, with shorter trapezoids; stay away from definition at the waist. Center front (CF): As the name implies, this line goes down the middle of the front of the figure’s torso, dividing it in half. It’s the starting point for all the clothes that your model wears. The center front line comes from pattern-drafting, or drawing patterns for the body; the center front location is the starting point for creating clothing patterns. Apex: The apex is the line that passes horizontally through the center of the breast or below the underarms. The apex lines up with the bottom of the armhole. Because many design lines flow directly from the apex line, paying attention to its location can help you design and draw clothing that falls properly on the body. Draw two sets of trapezoids — one male and one female. Draw a vertical dashed line down the center of each set of trapezoids to create the center front line for a front view. 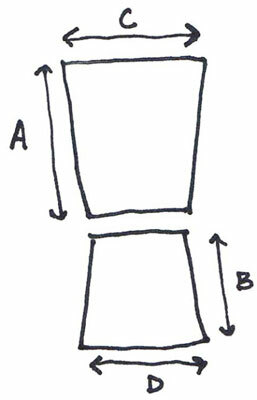 If the figure were to turn, the center front would appear closer to one side of the drawing than the other. For each set of trapezoids, draw a horizontal dashed line across the center of the upper torso to create the apex line. 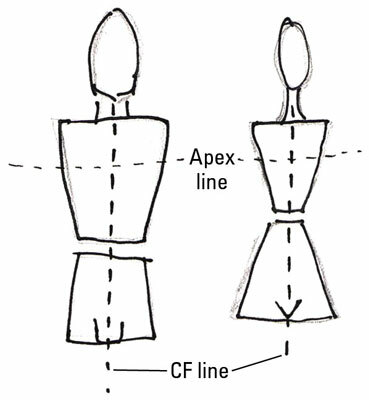 Lightly sketch the apex and center front lines each time you design clothing. Sketching in these lines helps you place seam lines in the correct locations.